The term "race car for the road” gets thrown around a lot. But if any road-going vehicle manages to approach the extreme levels of performance achieved by F1 cars, it'll be the Aston Martin Valkyrie. In fact, the highly anticipated forthcoming hypercar appears to be so far beyond anything else on the road that Aston Martin had to use an F1 simulator in its development. Fortunately, the British automaker just so happens to have one at its disposal, thanks to its partnership (and adjoining Advanced Performance Centre) with Red Bull Racing in Milton Keynes. Initially announced as project AM-RB 001, the Valkyrie will be Aston Martin's most extreme street-legal vehicle yet, and the first time Red Bull will translate its racing prowess to the road. 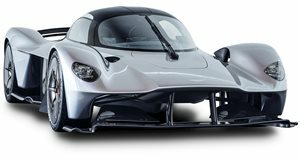 Its extreme shape stems from a joint design effort between Aston's chief creative officer Marek Reichman and legendary racing engineer Adrian Newey, and is built around an open floor plan to optimize airflow and reduce wind resistance. At its heart sits a 6.5-liter V12 being developed by Cosworth – naturally aspirated but augmented by a hybrid assist from electric-supercar specialist Rimac, with a seven-speed dual-clutch transmission from Ricardo. That's the same company that builds Bugatti's gearboxes and McLaren's engines. But that's not the only thing the Valkyrie shares with its rivals from Woking. Beyond its British origins and the essential concept of applying F1 experience into a road-going supercar, Aston poached McLaren's longtime chief test driver Chris Goodwin to usher its most daring project into fruition. And he's taken us behind the scenes of the Valkyie's ongoing (and surely exhaustive) development in this latest three-minute video, so we're gonna shut our traps now and let him do the rest of the talking.